Description: A cross pattee. (Obverse) a lion statant gardant on the royal crown, with the words FOR VALOUR on a semi circular scroll. (Reverse) a circular panel. The cross is suspended by a ring from a seriffed 'V' attached to a suspension bar decorated with laurel leaves. Bar: A sliding bar decorated with laurel leaves. Comments: Only three people have been awarded the Victoria Cross twice: Noel Chavasse and Arthur Martin-Leake, both members of The Royal Army Medical Corps, and New Zealander Charles Upham. 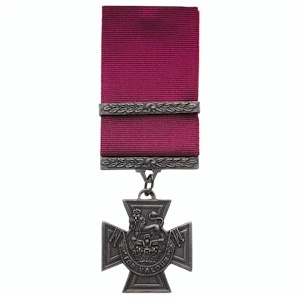 The second award is designated by a bar worn on the suspension ribbon of the decoration and this is known as a "VC and Bar". Noel Chavasse was during the First World War, a captain with the Royal Army Medical Corps. He was awarded his VC and Bar for his actions on August 9, 1916, at Guillemont, France and during the period July 31 to August 2, 1917, at Wieltje, Belgium. During these actions he attended to the wounded whilst under fire and after being shot himself. Chavasse died of his wounds in Brandhoek. Lieutenant-Colonel Arthur Martin-Leake was a surgeon captain in the Royal Army Medical Corps, during the South African War (Boer War). He was awarded his VC and Bar for actions on 8 February 1902, at Vlakfontein, South Africa, and during the period 29 October to 8 November 1914 near Zonnebeke. Martin-Leake attended to wounded men under heavy enemy fire, even after being shot himself. Captain Charles Hazlitt Upham was a New Zealand soldier. He won the VC and Bar in Crete in March 1941 and for his actions on July 14 and 15, 1942. On both occasions he displayed outstanding gallantry in fighting the Germans even after being badly wounded. He was eventually captured and branded ‘dangerous’ by the Germans for his continual escape attempts and he was incarcerated in the infamous Oflag IV-C (Colditz) on October 14 1944. When King George VI inquired of Major-General Howard Kippenberger whether Upham deserved a bar to the cross, Kippenberger replied: "In my respectful opinion, sir, Upham has won the VC several times over".